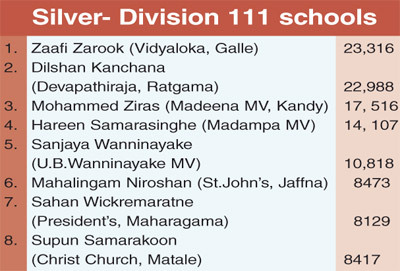 Picking winners of Observer-Mobitel School Cricket contest winners ..... from left. 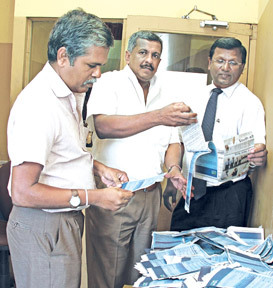 Kapila Ajith Kumara (Head of Projectal, Kamal Wijesuriya (Senior DGM Printing and Maintenance) Narada Sumanaratne (DGM (Admin) and HRM from ANCL) picking the winning coupons of the readers at the end of count 13. 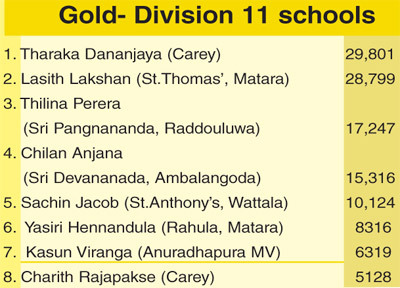 There were no changes in the other two segments with Carey’s Tharaka Dananjaya (29,801) and Lasith Lakshan of St.Thomas’, Matara in a tussle for the first two places. 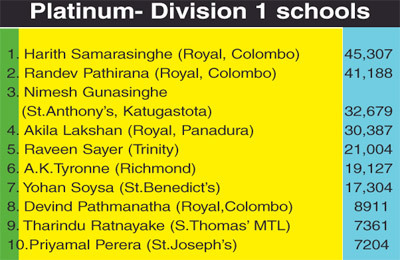 In the ‘silver’ category Zaafi Zarook of Vidyaloka ,Galle was once again placed first polling 23,316 votes to his closest rival Dilshan Kanchana of Devapathiraja, Ratgama who had 22,988 votes to be placed second.